With the purchase of the new toys detailed in other posts, it was time to test them out. I also had new hiking boots that needed breaking in, so a walk was in order. I wanted a summit I knew would be easy, and of the ones I’d been to before, that still had 2014 activation points available, only one met the bill: the unnamed summit VK3/VC-032. As mentioned in my last visit, this summit is a great point to activate from. It’s convenient to Daylesford and Melbourne, and not difficult to get to from Geelong, there’s a huge activation zone to set up in, and the road itself is pretty quiet and nondescript, so you don’t get bothered. 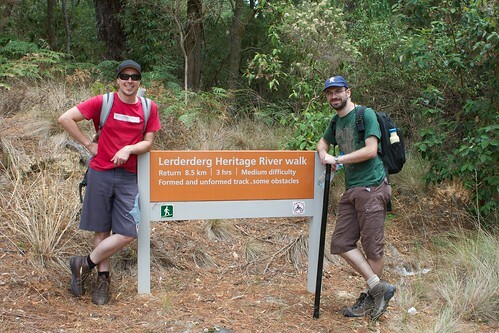 Its other great redeeming feature is that it’s on the Lerderderg Track section of the Great Dividing Trail. Couple the last paragraph with the first, add in a dash of public holiday courtesy of Labour Day, and we have the recipe for a bushwalk. 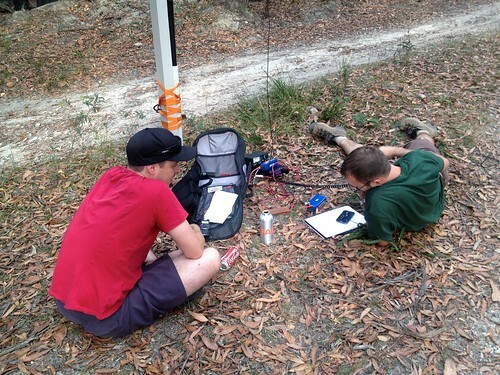 I dropped a note to my friends from my university days, Hayden and Wes, who were both keen to see a bit of SOTA action with some DX thrown in. A pizza lunch the week before helped us iron out the details, and we decided to set off about 2pm from The Garden of St Erth at Simmons Reef, and walk through to the Unnamed Summit on Camp Road. Being a one-way walk, there would be a ton of car shifting involved, especially since a young child was planned to brought along, and the matter of car seats needed to be considered. The child, incidentally, was one of our own, not a random young child. It turned into an exercise not dissimilar to the “ferry across the river” style brain teasers. A solution found, I drove my car to the end point at Camp Road, where I was to be picked up by Wes and carted to Simmons Reef. I was early this time, due to taking the Spargo-Blakeville Road instead of going all the way through Daylesford. Not having to drop people in Daylesford made this a lot quicker. The road up Camp Road is signposted and you simply stay on it until you intersect with Pines Track (watching, of course, the order of the vowels). I almost bottomed the car out doing a U-turn here, so choose a different point to turn your car around than I did, and I parked up on a clearing near the exit of the Lerderderg track, on the high point of the road. At this point, I received a text saying Wes was going to be 30 minutes late, so I grabbed my gear, walked out of the activation zone and back in, and activated the summit on 40m. Thanks to Allen VK3HRA for coming up first and spotting me. I worked about 10 stations (including S2S with Glenn VK3YY and Nick VK3ANL) before shutting down, expecting Wes to arrive any minute. After about an hour, Hayden arrived to pick me up, childless, which thankfully eliminated the crazy car swapping needed, because the hour long delay would have rendered our schedule impossible. We met Wes at Simmons Reef, and started the walk. It was about here that I realised I should have left the Buddistick at the top of Camp Road, as it had already been exited and re-entered into the activation zone, and carrying it added another kilogram I didn’t need to carry. We estimated the track to be about 12km long from the map. It is narrow in some places, and poorly signposted in others. To be fair, there are warnings on the Great Dividing Trail about missing signage on that section of the track, but still, there were some trailposts that had arrows going in all directions. Perhaps it is their way of ensuring you carry a map. At one point, we failed to find the track, but from the map knew we could walk along a 4WD trail and walk parallel to it before rejoining the track later on. 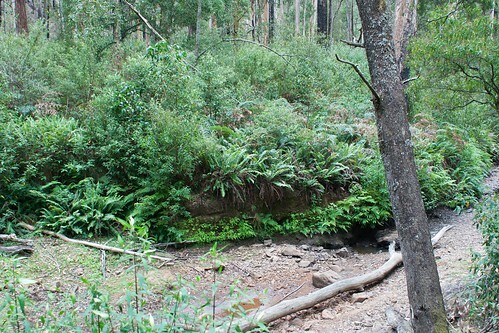 The initial section of the trail is part of the Lerderderg River Heritage walk, and the track follows the river in the early stages, before climbing out somewhat. 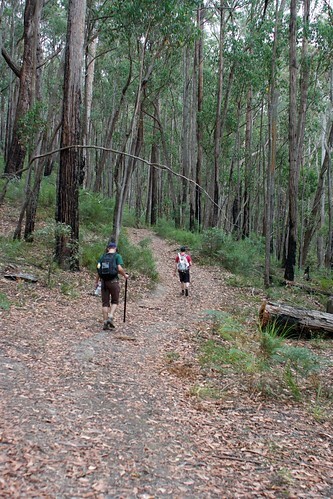 The scenery changes very rapidly, at some points similar to rainforest, and others common or garden eucalypt forests. It is also very quiet. We encountered one other family, early in the track section. This reassured us, as they would have scared the snakes away. The track is also a bit disconcerting when you look at it on a map. It follows a broad S shape, and you end up feeling like you’ve gone a long way when you first check your position on the map, but you still have a fair amount of doubling back to do. Our first stop was about a fifth of the way along. The next section of the track followed the river around, sitting about 100 metres off a 4WD track that had some, but not a lot of traffic on it. We climbed out of the river valley. Loose formations survive ambushes better! The track intersects with the 4WD track at various points, but always heads off a little apart from it. The trailposts, few that there were, were confusing, but this was merely a hint of the problems further along. We walked about another kilometre, and then we lost the track. I last saw it over there! I say “lost the track” to suggest that we ourselves were not lost. 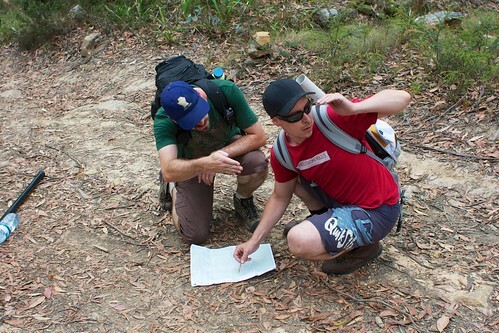 We knew where we were, and a GPS fix helped confirm that, but the track itself was hard to find. The natural curve it follows has you crossing the raging Lerderderg River (see photo below), which the map clearly indicates you shouldn’t, but the point where the track was shown on the map looked like inpenetrable bush. We decided that laziness was the better part of valour, and headed up to the 4WD track and walked along that for about a kilometre. The river. Don’t cross the river. We rejoined the track at a crossroads, complete with trailpost sitting idly by the track and redescended down into the forest. The foliage changed again, then we jumped out at another crossroads. Here the map shows the trail following the 4WD track, although in actual fact it occupies higher ground a few meters to the south of the 4WD track. After a while of scrub bashing, we stopped to treat my blisters (new shoes, remember?) and eat some food. At this point, we decided the scrub bashing was pointless given there was a fully formed track right next to us, and we continued on there. We again missed the signage to turn off, either through poor eyesight, or simply because the signage doesn’t exist. 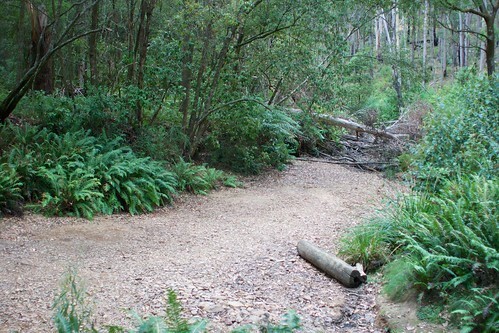 There is a small picnic ground (Nolan’s Creek Picnic Ground) where we saw a car packing up, but we turned left (south) down another 4WD track (Nolan Creek Track). The map shows the Lerderderg Track following Nolan’s Ridge Track. Hayden rightly read the lay of the land; the track headed to the east of Nolan’s Creek, dry at this time like most of the watercourses we encountered, and we were on the western side of that. We’d considered the western route as a way of shortening the track marginally and had decided we’d choose which way we’d go when we got there. In the end, poor eyesight or signage or both decided for us. The difference between the two boiled down to a longer, slightly gentler climb up to the high point of Camp Road, versus a more sharp ascent then a walk along the ridge slightly north of where I had parked. We chose the sharp ascent up Mountview Track, graded moderate if you are in a 4WD, graded “bloody stupid” if you’re on foot. Being youngish men, we powered our way up, stopping a few times when we realised we weren’t as “youngish” as we used to be. We passed another track, not marked on the map, called Days Track (I think), which may have been a gentler version of what we did. In any case, it joined in with Mountview Track along the ridge line, leading onto Camp Road, with a short walk up the hill to my car. 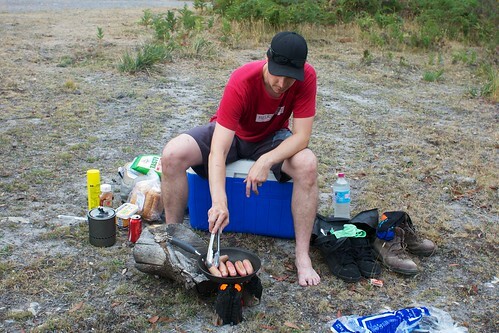 I set the gear up for the evening DX session while Hayden used his camp stove to cook up some sausages for hot dogs. I can honestly say it was a glorious meal after the long walk. Being a Monday, the amount of DX chasing was down, but we started the non-S2S with Don G0RQL in Devon, which is about 16,000km away in the short direction. Colin G4UXH also called in from the Lake District, before we had a few harder QSOs with continental Europe, with Frans ON5SWA in Belgium, Herbert OE9HRV in Austria, and a contact into Czech Republic. I got a call in from New Zealand straight after Don to qualify the summit on 20m, and a few VKs also called in, including Matt VK2DAG and Adam VK2YK. My SWR seemed a little high on 20m, compared to normal, but I couldn’t obviously see why. The station. Casual operating position. After the QSOs dried up on 20m, I headed up to 12m, a band I had not activated yet. It became obvious why I had a SWR problem when I realised I hadn’t raised the dipole to full height, probably because I was eager for food. I again found a clear frequency at 24,960 kHz and put out a CQ call and got a response from Hide JH7IFM, my first 12m contact and my first JA contact. After assaulting his ears with some Japanese, I found I was getting blatted over, as a DX station had come up 5 kHz below and the split crowd were heading up onto my frequency. I changed down 10kHz, but after five minutes of CQing, decided to call it quits. We had to head back to Simmons Reef to return folks to cars, and then I had a bit over an hour’s journey home. 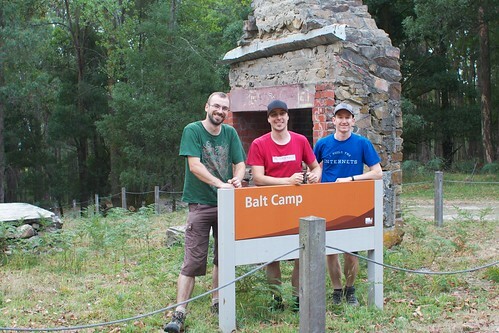 On the way back, we stopped at Balt Camp to have a look around, playing amateur archaeologists as we tried to work out how everything was set up. Wes finally decided to use his vast experience in DSLR car-roof photos to take another photo, and we were done. All up, it was a great walk, 13 km in total according to the GPS, and finishing with some good DX, a DX Summit to Summit, and some 12m action.